Minesweeper is well-known by the game in Microsoft Windows. The task is to place mines into empty cells in the grid. 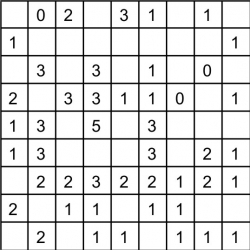 The digits in the grid represent the number of mines in the neighbouring cells, including diagonal ones.